A general contractor needed to core drill a 12" slab. The contractor wanted to avoid hitting any rebar or conduits within the concrete. This job took place in Manhattan, New York. The General Contractor called Ground Penetrating Radar Systems (GPRS), who he has worked with multiple times before hand to help with their project. 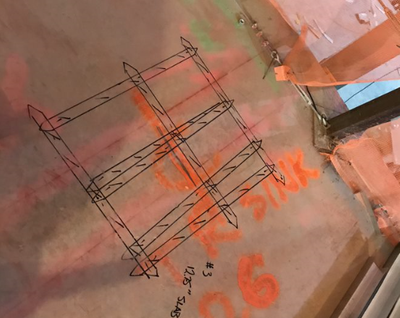 Grant McGuigan, who works out of the North East office and covers the Pennsylvania, Delaware, and New Jersey region, was able to scan the concrete. Grant marked out the rebar and any other conduits/pipes prior to core drilling. He also verified slab thickness as well. Grant McGuigan performs GPR scanning to locate reinforcing steel and other objects in the concrete. For assistance in the PA, DE, NJ areas, contact Grant McGuigan at (484)280-2234 or grant.mcguigan@gprsinc.com. We can provide rebar locating, post tension mapping, location of conduits, underground utility locating, and void detection.